The debate around vaccines has seen a surge in recent years, with many choosing not to vaccinate their children as a result. While anti-vaxxers might not be breaking any laws, those for vaccination have pointed out that they’re putting their own kids at risk and those around them. Why wouldn’t you vaccinate your kids? There’s always been a resistance to vaccines, with numerous studies being done to find a link between inoculation and debilitating conditions such as autism. Anti-vaxxers have used research such as one published in the Journal of Inorganic Biochemistry to link vaccinations to hepatitis B, among others. As a result, a growing number of parents have taken a stance against immunization in fear of the supposed dangers the treatment presents to their children. Although the findings of such research has been inconclusive, it hasn’t deterred anti-vaxxers from their staunch opposition to the treatment. In fact, many influential people such as Jenny McCarthy, Donald Trump and Sen. John McCain have been vocal about their opposition. 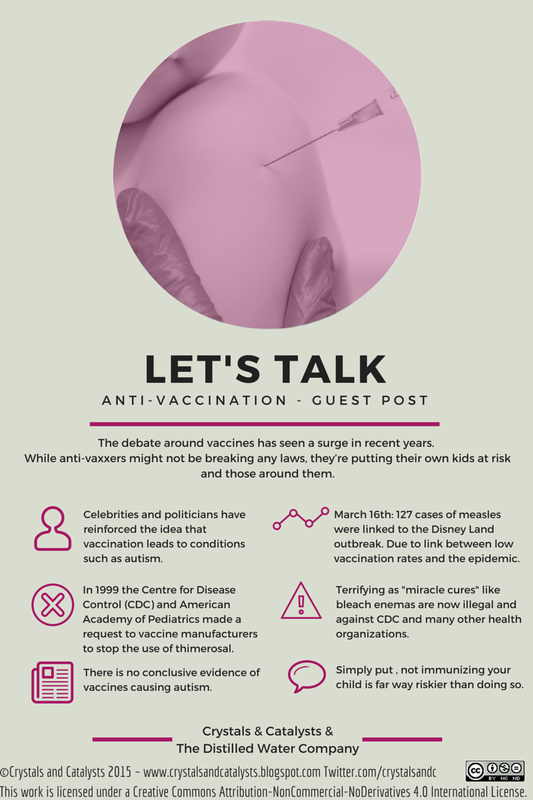 As a result, these celebrities and politicians have reinforced the idea that vaccination leads to conditions such as autism. So is there any possibility of vaccines causing autism? Thimerosal is a preservative that contains mercury and is the centre of much discourse around vaccines and autism. In 1999 the Centre for Disease Control (CDC) and American Academy of Pediatrics made a request to vaccine manufacturers to stop the use of thimerosal. As a result, many anti-vaxxers took this move as a definite indication that vaccines caused autism, reinforcing the fears of vaccines. Till this very day anti-vaxxers use the banning of thimerosal as a basis for not vaccinating their children even though the CDC clearly stated that requesting the removal of the preservative was more precautionary. Although they may have these fears, there is no scientific link between the preservative and autism. In fact, research published in the Journal of Pediatrics in 2013 found that increasing exposure to antibody-stimulating proteins and polysaccharides in vaccines is not associated with the risk of autism. This is not the only study done to try sway anti-vaxxers away from their opposition; a number of papers have been published to disprove the relationship between thimerosal, though no longer used in vaccines, and autism. In conclusion, no, there is no conclusive evidence of vaccines causing autism, and the fear is unfounded to say the least. But if people don’t want to vaccinate their kids, it’s their right, right? Parents aren’t required by law to inoculate their children, so it’s within their right to not do so. However, a recent outbreak of measles at Disneyland has placed major concerns around opposition. As of March the 16th 127 cases of measles were linked to the Disney Land outbreak. To make matters worse, a study by Boston Children’s Hospital highlighted a link between low vaccination rates and the epidemic. What the Disneyland case, and others like it, shows is that not only does the act of not vaccinating children put them at risk of acquiring deadly diseases such as measles, but it also puts children who are yet to be inoculated at risk of infection. This is where it gets dangerous. Children can only get vaccinated against MMR (measles, mumps and rubella) once they turn two. So if they come into contact with an infected person (measles can survive for two hours in the open), they will easily acquire a disease that may lead to death. Other than increased rates of infection, the anti-vaccination movement has far-reaching implications, but none as terrifying as supposed miracle cures like bleach enemas. Also known as Miracle Mineral Solution, bleach enemas have been touted as a cure for autism since 2010. The CDC and many other health organizations have alerted parents not to use it, with its distribution being illegal. This is because the solution includes bleach, which under no circumstances should be ingested. So anti-vaxxers have it wrong? Simply put, not immunizing your child is far way riskier than doing so. The fear itself has no scientific bases, and is partly the result of influential people with no scientific backgrounds, spreading misinformation. It’s essential to separate the facts from fiction. Yes, there have been studies done to find a relationship between vaccines and autism and hepatitis; there have been calls for certain preservatives to be removed. However, these studies have come up with no concrete evidence to link any of these conditions. Most anti-vaccination sources cut and paste information of these studies to reinforce their stances, but leave out the integral parts which clarify the absence of a link. Bio: Tendai Matsika is a writer for The Distilled Water Company. His fascination with the various applications of distilled water in the medical sector has taken him on a journey concerning various treatments and their impacts on society. The scientific and medical opinions expressed within guest blog posts are those of the author alone and do not represent those of Crystals and Catalysts (Mariam). The accuracy and validity of any statements made within this article are not guaranteed. Crystals and Catalysts (Mariam) is not liable for any errors or representations.